My Irish mate Pete Rollins is doing a USA tour right now. Pete is an original and provocative thinker and you won’t be disappointed if you go out to hear him speak. He was one of the favorites at Greenbelt this year. There are moments when he sees things from a completely unique perspective and comes up with unpredictably brilliant thoughts. And there are other times when his occasionally predictable subverting of phrases reminds me of The Sphinx from Mystery Men. Pete’s first book was called How (Not) To Speak of God. I reviewed it and loved it so much that I went over to Belfast and crashed at Pete’s house for a few days and let Pete feed me and talk about his book. While I was there, I photographed parts of his extensive library so we could all see the books that inspired him – mainly philosophy and phenomenology and books by obscure French people. Photos are here. More recently, Pete published an excellent book called The Fidelity of Betrayal. Its really good. Its NOT a book that explores postmodern thinking about faith. Thank God – we have far too many of them already. Instead, its a book about faith written by a postmodern thinker and that makes it worth reading. Anyway, download a sample of the book and check it out yourself. I don’t believe that everyone should write a book. These days there are FAR TOO MANY LAME AND INSIPID BOOKS coming out every month, especially from the Christian publishing world. But Pete should write. And Pete should keep on writing. One day soon he will write a masterpeice and when he does, I will remind you that I predicted it here. But in the meantime, go and hear him speak. And don’t make fun of his height. Mysterymen – HA! That’s awesome. What an analogy. A dear friend of mine, Bob Burden of Flaming Carrot Comics fame, created & owns The Mysterymen. It came out the same weekend as The Sixth Sense and, I believe, Fight Club, so it was unfortunately doomed at the box office. 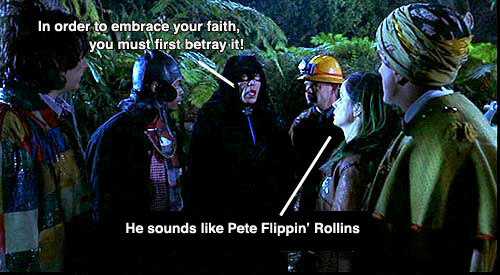 But it lives on in Pete Rollins references! The Sphinx, that’s great. Your post about Pete Rollins was intriguing enough, but reading through the download, it’s now on my must read list. I’m looking forward to reading more. I was a little dismayed that I missed Grand Rapids on the 5th (that’s not incredibly far from where I live), but I see he is back in the area early in 2009, so I am penciling it in on my calendar. Thanks for this Andrew. I shared a couple of pints with Pete back in ’04 in Belfast, at a pub where he arranged a gig for our band. A very nice bloke who left an indelible impression on me. I look forward to reading this new installment. I absolutely adored Fidelity. His exegesis of the life and biblical text of Judas is simply fabulous. His overall thesis that in order to experience Christ, one must crucify Christianity has been conceptually a big mode of thinking of me recently. Reading this was like enjoying a nice green salad with house dressing with a nice big potato on the side. Filling, but not weighty.